The road to Amarillo is long for a dog with short legs. Sometimes things happen. Things like riding an armadillo. 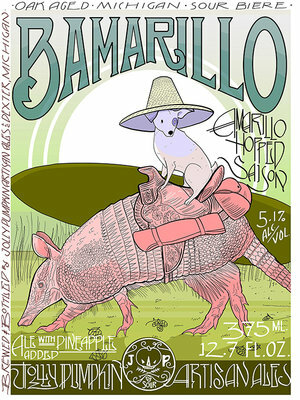 Bamarillo uses the same grist bill as Bam Bière, but with half the amount of Crystal and Cascade hops. Amarillo hops were added in place for their rich, tropical fruit qualities. Bamarillo was aged in an oak foeder for three months, and in the final month of aging, pineapple puree was added to accentuate the hops fruity characteristics. Before packaging, Bamarillo was dry hopped with both Crystal and Amarillo hops. A fruity, dry, and drinkable ale. Bamarillo is there for you to make things happen. One day Bam went down to Texas. Praying for surf. He didn’t set out to ride an armadillo. Who does, really? He didn’t set out to have a veritable sea of chestnut trees either. But along the road to Amarillo dry hopped saison, things happen. Things like riding an armadillo. And naming it Ben. Ben the armadillo. Ben there, done that.